XCStats Track & Field includes the features you need to manage and motivate your team, provide complete and accurate performance reports and graphs and communicate with your team community all while saving you time! Read and view the features of XCStats Track & Field below then watch our video for a walk-through. Click on slide to advance or on the numbers. XCStats includes a full range of performance reports and charts - 14 in all - by individual, by meet, by season and all-time. Plus career and season comparison charts! And you can hide them from your competitors! We have 4 ways to load results depending on the source format. The easiest is to enter the URL of the page where the results are, and we do the rest! Or do a simple copy/paste from a file. Or import a csv file. A method for each source type! With XCStats, it's a snap to create and update your meet assignments. Our Meet Planning tool lets you dynamically assign athletes to events and divisions and publish the results to the web or to a spreadsheet. XCStats includes a complete email and text messaging system which collects athlete and parent email addresses and provides convenient tools to send messages via email or text. Create custom groups for easy audience selection. No need to maintain your own list! Athletes can perform all their functions via our iPhone/Android App. They can enter their training logs, set goals, create absence requests, upload photos, send emails to coaches and manage their accout all from their phone. It's fun and convenient to use. We remove the "paperwork" so coaches can increase performance without increasing work. Athletes enter their goals, and pre and post meet notes, for the coach to review and comment. The meet report highlights achievement towards their goals. Athletes can enter their workout info from their phone or computer so coaches can monitor their training and provide feedback. Coaches can easily review whether athletes are entering their logs and send reminders if they're not. Enter qualification standards for upcoming meets and designate which meets count towards qualification. Based on these standards, XCStats shows who has achieved the standard and who is close. Visibility of this information can help motivate kids. Based on the scoring rubric of past meets, XCStats talleys the point totals for each athlete as the season progresses. The resuls are displayed on graphically so everyone can see the race to the top! Use XCStats to manage student attendance in your sport. Take attendance directly on your mobile device, then export the results for the school administrators. Athletes and parents can create and submit absence requests to you. Watch our walk-through video for a more detailed look at the application! All that's included, with links to examples where possible (some reports are only available to subscribers). Comparison Charts of Event Results - Overlay athletes performances for a given event in a single season. See an example by selecting athletes from this report and selecting "Graph Selected Athletes". Career Comparison Charts - Overlay the career of athletes for a given event. See an example by selecting athletes from this report and selecting "Graph Selected Athletes". Season-Long Point Leaders Chart - Create charts for each division which show your leading point-gettings all season long. Overlay different athletes to encourage competition. Qualification Criteria and Achievment Report - Enter the qualification standards for progressing to the next round of competition and generate reports showing accomplishment of those standards. Athlete Career Page - Includes Track & Field and Cross Country results and charts. Training Log Distance Report - View weekly or cumulative training mileage. Top 10 Training Workout Report - Encourage competition amongst your athletes by tracking the best times for your workouts. Roster Report - View, export and modify your roster. Meet Plan - View the athlete assignments for the upcoming meet. Goal Setting System Athletes examine past results to set goals and enter pre- and post-race comments. Coaches review goals, send emails to athletes to comment on their goal. Training Log System A complete system for capturing and analyzing training informtion. Mobile Apps - Specially designed goal setting and training logs forms and pages designed to make utilizing these features fun, easy and convenient. Meet Planner - Quickly and easily assign (and adjust!) athletes to events and divisions for upcoming meets. Publish the finalized plan to a web page or print and take to the meet. Medley Team Optimizer - XCStats tells you your fastest medley team based on previous PR's and the availability of athletes for particular distances. Competitive Analysis - Here's a fun one! Load results from your competitor into XCStats via our import from webpage method then generate comparison reports between the teams. Adjust your meet plan to maximize your points! Track Season Point Getters - Create reports and graphs showing the leading point-getters as the season progresses! Set Qualification Standards - Enter qualification standards for different events and report on who has achieved the standard and who is close. Email System XCStats collects athletes and parents email addresses during the registration process. Then coaches can send emails to athletes and parents directly from XCStats. Text Messaging - When email is just not fast enough! Send bulk text messages to parents and athletes directly from an XCStats web page. No need to collect or type in phone numbers - XCStats handles that during the registration process. Communications Preferences - Parents and athletes can specify their desired method of electronic communication from the coach, text messages or email. In the team discussion forum, they can choose to automatically receive all, some or no postings. Team and Task Management System - A comprehensive system which allows coaches to define team administrative tasks, such as the return of forms or money, and then track the athlete's completion of those tasks. Other tasks include goal setting and entering training log data. Attendance Management System - Coaches can take attendance on their mobile device, then create summary and daily reports for the administration office. Combined with the email system, a coach can send emails to athletes and parents if they exceed team limits for unexcused absences. Also includes planned absence notifications from parents and athletes. Four Methods to Load Results! - Loading results is easier than ever using a whole range of methods, depending on the format of your source. The methods are: 1) Direct entry using a customizable data entry form; 2) File upload - using a specified format, upload historical or current track & field results; 3) Copy/Paste from file - grab the results from your hy-tek formatted PDF file and paste into XCStats; and 4) Input from webpage - simply enter the URL of the page where your data exists and import! Team Web Site - XCStats can be your teams web site! With the email system, discussion forum, file upload and stats, you have everything you need for a basic site. Share Link Tool - athletes and parents can add links to your XCStats site to share information such as photos, articles and videos. Discussion Forum - A private forum for athletes, coaches and parents to share experiences, plan logisitics. Upload Files and Forms - for easy access by your team. Athlete Name Spelling-Fix Tool - For coaches to clean up inconsistent names. Parents and Athlete Email Form - Parents and athletes can send emails to the coach directly from XCStats. Calcuate, distibute and update accurate STATISTICS. Implement easy to use and effective team COMMUNICATIONS methods. Simplify and streamline TEAM MANAGEMENT. Read below how XCStats is designed to help coaches address thse challenges, save time and build a more enjoyable, desireable and successful athletic program. Then, check out our special offer for new subscribers to discover how easy it is to get started with XCStats Track & Field. CHALLENGE: Maintaining accurate track & field statistics for the entire team is daunting and time consuming. With XCStats, all calculations, adjustments and conversions are performed automatically and XCStats provides a wide range of reports and charts which are designed to motivate, regardless of the skill of the athlete. The reports are improvement-based and improvements are calculated in many ways (compared to last result, to PR, to last year) to insure that no accomplishment is overlooked. It's this recognition that motivates high school athletes, gives meaning to their training and instills a feeling of success, whether or not their performance counts toward the official scoring. XCStats makes liberal use of dynamic charts which is fun and engaging for athletes, parents and coaches. Users can overlay the performances of multiple athletes to understand the comparisons or look at trends of performances. Hours of fun await! And all these great reports and charts do not need to get into the hands of your competitors! With just a few clicks, coaches can display their stats to only those within their track & field community and not to the public. CHALLENGE: Good communications is essential for a successful program and the internet has brought more options. However, they can become time-consuming obligations, such as building and maintaining a web site, or collecting and keeping email addresses up-to-date. It can be even by your team web site! The XCStats email system collects parent and athlete email addresses during registration so coaches don't need to transcribe (and mis-type) addresses. Email messages are sent one-at-a-time so addresses are not distributed without permission. And parents and athletes can even send emails to the coach from their XCStats site. CHALLENGE: The size of the team or the "paperwork" sometimes limits the adoption of coaching best practices. Research shows that the fastest, most effective way to improve performance is to set a goal, yet very few coaches have implemented a goal setting procedure broadly and consistently. Why? Because with large team sizes and many events, it's a paperwork nightmare! XCStats includes a goal-setting system so athletes can set goals, and coaches can review them, in seconds. Many coaches like to monitor the training of their top athletes, whether a summer running program or mid-season workouts. XCStats includes a training logs recording and charting tool so athletes can easily enter their workouts, coaches can review them and both can chart their cumulative or weekly mileage. It even includes a year-over-year option so athletes and coaches can compare their training against previous seasons. CHALLENGE: Less than half of available coaching time is spent actually coaching. Most of the time is spend on administrative tasks, keeping statistics and communications. At XCStats, we've already drastically reduced the time coaches need to spend on stats and communications, so now we're helping to minimize your administrative burden! XCStats allows coaches to assign tasks, such as turning in forms, money or checking out uniforms, and record their accomplishment. Nothing fancy there - you can do that with Excel. But the XCStats advantage is that it's integrated with the email system and with the personalized athlete and parent pages. We've built a reporting system around task accomplishment; so for example, you can create a list of all the people who haven't turned in their transportation money. Then, you can export the list to Excel or, with a single click, send an email reminder. We even write the message for you! No excuses for missing a deadline and a lot less anguish for the coach. Special Offer for New Subscribers! 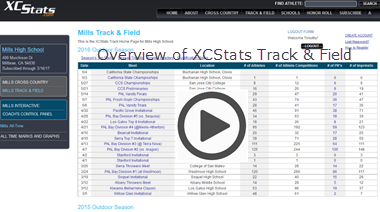 XCStats Track & Field in available to new subscribers for only $50 per school! You get full functionality: complete performance reports and charts, the email system, goal setting, training logs, web site, discussion forum and team management tools � the WORKS! Go to our sign up page to subscribe now or requrest more information!